Thomas Hart Benton (Neosho, Mo., 1889 – Kansas City, 1975) American painter. He studied art in Paris and New York. Benton is considered the best-known American muralist of the 1930s and early 40s. His mural paintings depict common everyday scenes of Midwestern life. 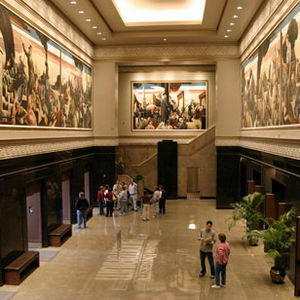 The most famous are in the Missouri State Capitol in Jefferson City and in the Truman Library in Independence, Missouri. One of his students was Abstract Expressionist Jackson Pollock. This page was last modified on 11 July 2016, at 19:33.